SYRACUSE, NEW YORK—The Syracuse Spartans (17-23) spent their Friday squaring off in a crucial double header against their rival, Syracuse Salt Cats (17-23). 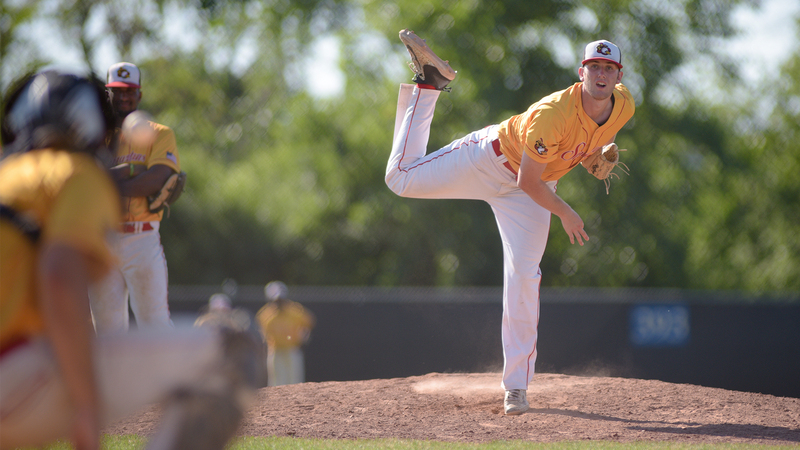 For the Spartans, it was a chance to capitalize on Sherrill, who was two games up on the Spartans heading into the day, losing two games of a double header to the Onondaga Flames. In game one of the double header, the Spartans squandered their opportunity as the Salt Cats came out on top, 8-2. Stuart Martin took the ball for Doug Willey’s staff, going 2.1 innings, giving up eight earned runs on six hits, striking out two. Michael Bubniak took the ball and did well, pitching the remaining, 3.2 innings, allowing just three hits and no runs, striking out three. The Spartans bats didn’t have their best day, notching just three hits against the Salt Cats pitching staff in game one, resulting in just two runs. Game two was much of the same for the Spartans offense, recording three hits again, but this time producing just one run. However, Joe Guerette came up with a much better performance on the mound. The College of Saint Rose right-handed pitcher was dominant on the mound for Syracuse, over powering the Salt Cats lineup. Guerette’s line read 6 innings, giving up 4 hits and just 1 earned run, striking out 7 Salt Cats. The Spartans offense had just three hits, from the likes of Josh Loeffler, Ray Zincone, and an unlikely candidate in Michael Paciocco. Usually a reliever for the Spartans, Paciocoo has been called on to play some third and shortstop given the injuries to Lou Miceli and Andrew Pedone. Paciocco scored the only run of the ball game for the Spartans. All in all, in 14 innings of play the Syracuse offense scratched just six hits together. The injuries for Syracuse have affected the offense most without Eddie Pietschman, Miceli, and Pedone. All batters with over 20 RBIs, and batting over .270. The Spartans can now be eliminated from the playoffs with one more loss. Syracuse and Sherrill are the last two teams in the NYCBL Eastern Division who can qualify for the playoffs. Sherrill holds a two-game lead over the Spartans for third place in the Eastern Division. The Spartans take on Sherrill at Noyes Park tomorrow, July 21st, at 2:00 pm in Sherill, New York. The final Spartans game of the regular season is at home on Sunday, July 22nd, at 1:30 pm. The Spartans host the Syracuse Salt Cats at Blink Fitness Field at Hopkins Road Park.